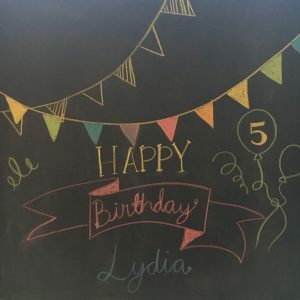 I wanted a way to capture life at this very moment; the days surrounding Lydia’s 5th birthday. So I’ve decided to write little blog entries on the children’s birthdays so that in time I can look back and hopefully be able to re-live these very special moments. Our wonderful ‘baby’ girl, you’re turning 5! I use the word ‘baby’ very loosely because you are anything but, of course. But you’re my firstborn, in some ways you’ll always be my baby in my eyes. 5 seems so grown up though. There’s nothing else for it, you’re just a ‘child’ now, long gone are the days where I could label you a newborn, a toddler, a pre-schooler, heck, I can’t even say you’ve ‘just started school’ because, like it or not, you’ve finished your first year and you’ll no longer be the baby of the school anymore. 5 is a proper little girl, and I feel like you’ve really grown up recently and I keep catching little glimpses of what the future might be like when you’re older still. It excites me and it terrifies me, it’s that crazy double-edged sword that us parents have to endure: the one where we can’t wait for you to grow and reach your next milestones but at the same time we want to keep you small forever. And 5 is a quarter of the way to 20. I feel I may be getting ahead of myself slightly here but it’s true, it’s becoming increasingly difficult to ignore the fact that we’re just borrowing you for a while, nurturing you and helping you grow, but ultimately, you are your own person and you will inevitably one day fly the nest. And that one day is getting closer and closer, although it’s still a long way off for now. At school you are currently the very youngest pupil, completing your first year before you’ve even turned 5, but my gosh, how you have made me and your Daddy so very proud. You have got stuck in and got down to learning with such enthusiasm, always keen to learn more and your hard work and determination to keep trying and to never give up was shown in the fantastic end of year report you brought home a few weeks ago. But more than any academic achievement that can be measured by data, we are most proud of how your confidence has grown. Not so long ago you hid behind my legs if someone asked you a question and you’d stare up at me with those big, beautiful eyes of yours and sometimes, if you were really nervous, your tongue might slip out of the corner of your mouth. But now, you answer back politely and can hold a conversation with other children and adults alike. Sure, you sometimes still look a little nervous, but no longer do I need to stroke your hair and reassure you that it’s ok, you’ve just gone a little shy. And going to school has helped you do this. They’ve nurtured and encouraged you gently to get involved and gradually pushed you further out of your comfort zone to get you to this point and I know they will continue to do this with care and love as you progress further through your wonderful school. Outside of school, you love your ballet, heck, you even told me yesterday how you want to be a ‘proper ballerina’ one day. And you love being outdoors, for a muddy walk, playing in the garden, splashing in a paddling pool, running around at the park. And above all, you love playing with your brother and sister, although I know they drive you crazy at times. Lydia, you may never know how much we love you until you have your own children one day, but just know, we are incredibly proud of you and I couldn’t ask for a more wonderful 5 year old. Happy birthday gorgeous girly, you’re incredible.